As the only genuine British Company accredited to ISO 9001, ISO 13485 and 93/42/EEC Medical Device Directive, Precision UK Ltd also take pride in supplying complete Medical Gas Pipeline Systems with CE Certified products and Kite marked Copper Tube. Operating on a Quality Management System which complies with the requirements of ISO 9001 and ISO 13485 has allowed us to design, assemble, test and supply all of our products whilst maintaining unparalleled practice and customer service, assisting us in attaining a primary role in shaping and developing the Medical Gas Pipeline Systems Industry. 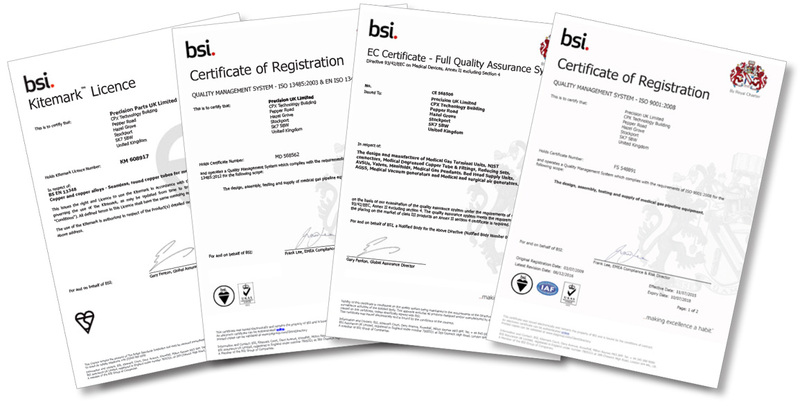 The growing number of certificates accredited to all aspects of our work proves that we are committed to unmatched standards and continual improvements within our products. Our practices are consistently and frequently evaluated to ensure in terms of quality, safety and performance, we are providing our best each and every time, without fail. All of our products are manufactured in the UK and are compliant with a number of widely recognised and esteemed standards, confirmation can be provided with certification stamped by ourselves or the chamber of commerce.